Sustainable development considerations make investment policies more challenging and multifaceted. Policymaking is becoming more divergent, reflecting the variety of approaches with which societies and governments respond to the effects of globalization. This, together with more frequent government interventions, has also reduced predictability of investment policies for investors. While many countries continue to promote foreign investment, some are also taking a more critical stance towards foreign takeovers and individual investment decisions of companies. At the international level, IIA reform is in full steam, resulting in the modernization of treaties, but also in the withdrawal from the regime by some countries. Megaregional agreements are increasingly difficult to negotiate and implement.These developments may be temporary turbulences in a rapidly changing world as governments reposition themselves, or they may announce policy changes of a more lasting nature. A rules-based investment regime that is credible, has broad international support and aims at sustainability and inclusiveness can help reduce uncertainty and improve the stability of investment relations. These developments may be temporary turbulences in a rapidly changing world as governments reposition themselves, or they may announce policy changes of a more lasting nature. A rules-based investment regime that is credible, has broad international support and aims at sustainability and inclusiveness can help reduce uncertainty and improve the stability of investment relations. UNCTAD data show that, in 2016, some 58 countries and economies adopted at least 124 policy measures affecting foreign investment – the highest number since 2006. Of these measures, 84 related to the liberalization and promotion of investment, while 22 introduced new restrictions or regulations (the remaining 18 measures were neutral). The share of investment liberalization and promotion measures stood at 79 per cent, considerably lower than in the early stages of UNCTAD’s annual reporting in the 1990s (94 per cent) (figure 10). Entry conditions for foreign investors were liberalized in a variety of industries, especially in financial services, extractive industries and real estate. Numerous countries streamlined registration procedures, provided new investment incentives or reformed their domestic investment dispute resolution system. Other noteworthy features were ongoing privatizations and the adoption of new public-private partnership regimes in some countries. New investment restrictions or regulations largely reflect concerns about foreign ownership of strategic industries, national security and the competitiveness of local producers. They manifest themselves not only in new legislation, but also in administrative decisions of host countries, in particular in the context of merger controls involving foreign takeovers. Companies are also exposed to political pressures influencing investment decisions and to retention measures discouraging them from investing abroad. Furthermore, increasing numbers of trade restrictions, as reported by the World Trade Organization, may negatively affect foreign investors, particularly those operating in global value chains. All this qualifies the picture painted above of an overall favourable policy environment for foreign investment. A recent UNCTAD survey shows that more than 100 countries, particularly developing countries, govern cross-border investment through dedicated national investment laws that address a similar set of issues as international investment agreements (IIAs). Commencing with a preamble or a section on the objectives and scope, both investment laws and IIAs contain provisions on definitions, entry and establishment of investment, treatment and operation, investment promotion and dispute settlement. To date, neither sustainable development issues nor investment facilitation are prominent features in investment laws and IIAs. While investment laws and IIAs have many commonalities, they show considerable diversity with respect to specific provisions and drafting details. Reform of IIAs and the modernization of corresponding clauses in investment laws should go hand in hand. In 2016 countries concluded 37 new IIAs – 30 bilateral investment treaties (BITs) and 7 treaties with investment provisions (TIPs). That brought the total to 3,324 agreements (2,957 BITs and 367 TIPs) (figure 11). The most active country was Turkey, concluding seven treaties, followed by Canada, Morocco and the United Arab Emirates with four treaties each, and the Islamic Republic of Iran and Nigeria with three treaties each. Between January and March 2017, four additional IIAs were signed. 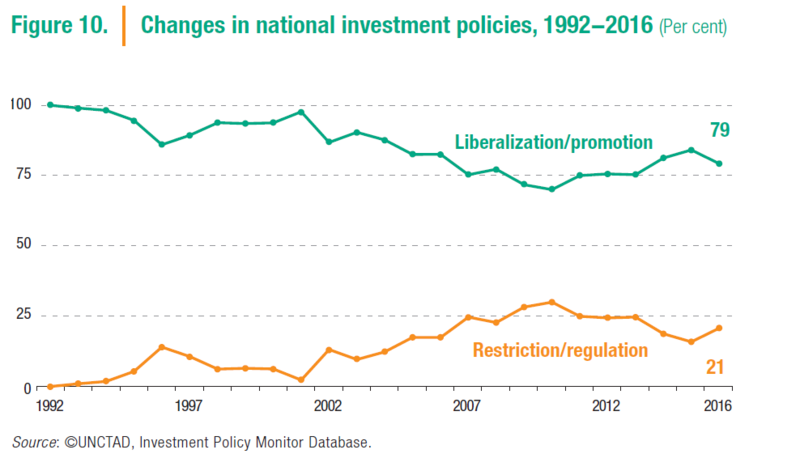 Governments also re-adjusted their engagement in international investment policy. Terminations of at least 19 IIAs became effective, with more to come. Countries particularly active in terminating treaties were Indonesia (with 11) and India (7). For megaregional treaties with substantive investment rules, such as the Trans-Pacific Partnership (TPP) or the Transatlantic Trade and Investment Partnership (TTIP), prospects remain uncertain. In 2016, 62 known investor–State dispute settlement (ISDS) cases were initiated (figure 12). This number is lower than in the preceding year but higher than the 10-year average of 49 cases per year (2006–2015). As of 1 January 2017, the total number of publicly known claims had reached 767. 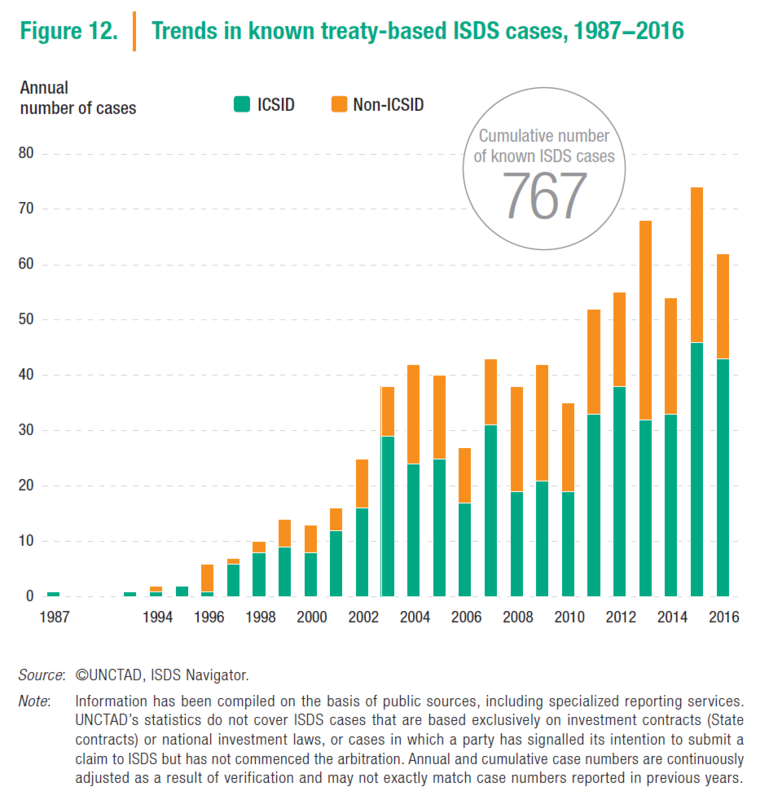 So far, 109 countries have been respondents to one or more known ISDS claims. As arbitrations can be kept confidential under certain circumstances, the actual number of disputes filed for this and previous years is likely to be higher. Forty-one arbitral decisions were made public in 2016. Of these decisions, States prevailed at the jurisdictional stage in approximately half, while investors won more of the cases that reached the merits stage. Of the total number of known cases decided on the merits, investors won 60 per cent. The non-binding Guiding Principles for Global Investment Policymaking were endorsed by G20 leaders, constituting the first time that multilateral consensus on investment matters has been reached between such a varied group of developed, developing and transition economies, accounting for over two thirds of global outward FDI (including the EU). Drawing upon UNCTAD’s Investment Policy Framework for Sustainable Development, the G20 Principles have the following main features: New generation: The Guiding Principles contain key new-generation investment policy elements, such as sustainable development and inclusive growth, the right to regulate for public policy purposes and responsible business practices. New generation: The Guiding Principles contain key new-generation investment policy elements, such as sustainable development and inclusive growth, the right to regulate for public policy purposes and responsible business practices. Global statement: The Guiding Principles are a statement of the G20’s collective position on the four key building blocks of investment policy and treaty making: establishment, protection and treatment, promotion and facilitation, and dispute settlement. Improving coherence: A key driver for the Guiding Principles was the desire to strengthen policy coherence between national and international policies and to strengthen consistency between investment policies and other policy areas, as well as sustainable development objectives. Delicate balance: The Guiding Principles try to strike a delicate balance between the rights and obligations of firms and States, between liberalization and regulation, and between the strategic interests of host and home countries. Non-binding instrument: The Guiding Principles are non-binding. They are intended to serve as a guiding instrument for reviewing and formulating national investment policies and strategies. They are also intended to serve as an important reference for drafting and negotiating international investment treaties. Sustainable development-oriented IIA reform has entered the mainstream of international investment policymaking. 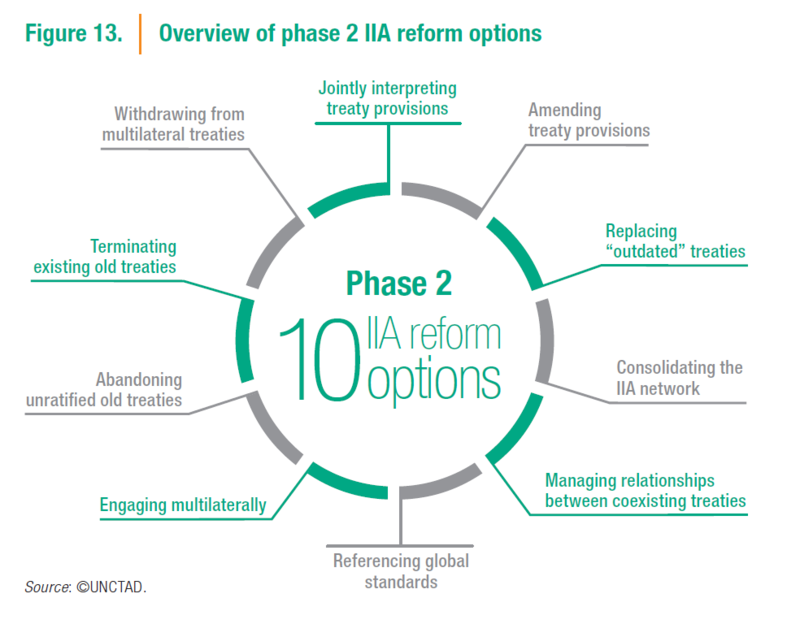 Consolidating phase 1 of IIA reform, most new treaties follow UNCTAD’s Road Map (WIR16), which sets out five action areas: safeguarding the right to regulate, while providing protection; reforming investment dispute settlement; promoting and facilitating investment; ensuring responsible investment; and enhancing systemic consistency. Some provisions that were considered innovative in IIAs concluded through 2010 now appear almost regularly in IIAs. Almost all of the recently concluded IIAs contain at least one or two reform features, typically new language that preserves host States’ right to regulate, improves dispute settlement or fosters responsible investment. Moreover, a few recent IIAs pursue the five action areas in novel ways that have not been used in earlier IIAs. However, some countries are holding back from modern treaty drafting practices. In addition, substantial differences in the IIAs concluded by a given country at about the same time raise concerns about an increase in inconsistencies in and fragmentation of the IIA regime, rather than a decrease. Reforming dispute settlement is high on the agenda, with concrete steps undertaken (e.g. reform-oriented clauses in new treaties, work on the establishment of an international investment court), including at the multilateral level. Investment facilitation has also become an area of greater interest in investment treaty making. UNCTAD’s Global Action Menu for Investment Facilitation, launched in WIR16 to fill a systemic gap in national and international investment policymaking with a view to mobilizing investment for sustainable development, has obtained strong support from all investment and development stakeholders. Several factors make a strong case for reform of the existing treaty network. 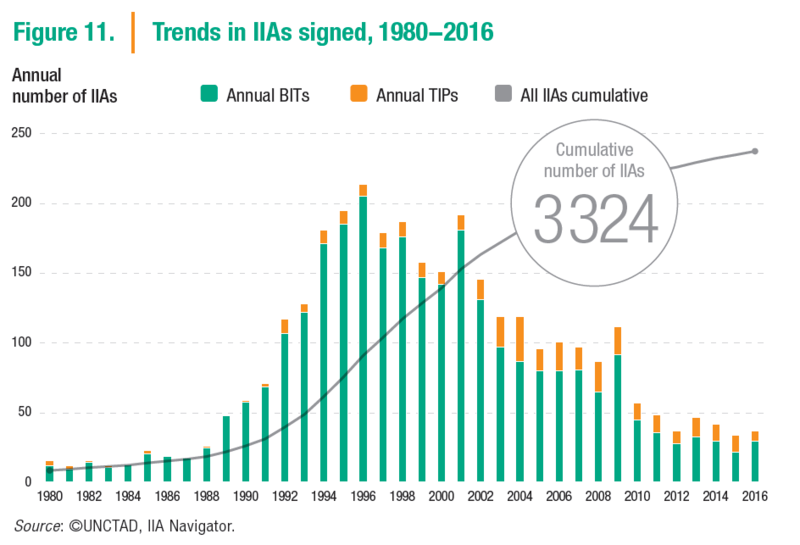 Old treaties abound: more than 2,500 IIAs in force today (95 per cent of all in force) were concluded before 2010. Old treaties “bite”: as of end-2016, virtually all known ISDS cases were based on those treaties. Old treaties perpetuate inconsistencies: their continued existence creates overlaps and fragmentation in treaty relationships and poses interaction challenges. Jointly interpreting treaty provisions: IIAs with broadly worded provisions can give rise to unintended and contradictory interpretations in ISDS proceedings. Joint interpretations, aimed at clarifying the meaning of treaty obligations, can help reduce uncertainty and enhance predictability for investors, contracting parties and tribunals. Amending treaty provisions: The expansively formulated obligations common to old IIAs may sometimes be difficult to “fix” through a joint interpretation. By amending treaty provisions, the parties can achieve a greater degree of change and thereby ensure that the amended treaty reflects their evolving policy preferences. Replacing “outdated” treaties: Treaty replacements offer an opportunity to undertake a comprehensive revision of the treaty instead of selectively amending individual clauses. Consolidating the IIA network: Abrogating multiple “old” BITs and replacing them with a new plurilateral IIA can help to modernize treaty content and reduce fragmentation of the IIA network at the same time. Managing relationships between coexisting treaties: Where countries opt for maintaining “old” and “new” treaties in parallel, IIA reform objectives will be achieved only if – in the event of conflict or inconsistency – the new, more modern IIA prevails. Referencing global standards: In their IIA reform efforts, countries can refer to multilaterally recognized standards and instruments, which reflect broad consensus on relevant issues. Referencing them can clarify a treaty’s object and purpose, while helping overcome fragmentation between IIAs and other bodies of international law and policymaking. Engaging multilaterally: A joint approach to IIA reform by the international community can have the greatest impact but will also be the most difficult avenue for IIA reform. Abandoning unratified old treaties: Many old BITs, have yet to enter into force. A country can formally indicate its decision not to be bound by them to help clean up its IIA network and promote the negotiation of new, more modern treaties. Terminating existing old treaties: Terminating “outdated” IIAs – whether unilaterally or jointly – is a straightforward (although not always instantaneous) way to release the parties from their obligations but may also affect their perceived attractiveness as investment locations and reduce the protection of their nationals investing abroad. Withdrawing from multilateral treaties: Unilateral withdrawal from an investment-related multilateral treaty could help reduce a country’s exposure to investor claims, but it may also affect its perceived attractiveness as an investment location and reduce the protection of its nationals investing abroad. It could also create challenges for future multilateral cooperation on investment. These 10 options can help address the 5 key areas set out in UNCTAD’s Road Map for IIA Reform. They vary in nature and outcome, ranging from more technical to more political, from a focus on procedure to one also addressing substance, and from continuous engagement with the IIA regime to an exit from the regime. Countries can adapt and adopt these options to pursue their desired reform objectives. Determining which of these 10 policy options is right for a country in any situation requires conducting a careful and facts-based cost-benefit analysis, as well as addressing several broader challenges. Strategic challenges include preventing “overshooting” of reform, which would deprive the IIA regime of its purpose of protecting and promoting investment. Reform efforts, particularly comprehensive ones, should harness the benefits that can be obtained from the rule of law and respond to investors’ expectations of predictability, stability and transparency in policymaking. Systemic challenges arise from gaps, overlaps, inconsistencies and fragmentation in a regime that consists of thousands of agreements that differ in content and type. Reform should work towards improving the coherence of the IIA regime, consolidating and streamlining the IIA network and managing the interaction between IIAs and other bodies of international law. Coordination challenges require prioritizing reform actions and properly sequencing their implementation with treaty partners, as well as aligning reform efforts at different levels of policymaking. Capacity challenges make it hard for smaller countries, particularly LDCs and smaller developing countries, to be effective in addressing the deficiencies of old-generation IIAs. Comprehensive regime reform would benefit from intensified multilateral backstopping. UNCTAD, through its three pillars of work – research and policy analysis, technical assistance and intergovernmental consensus building – can play a key role, as the focal point in the United Nations for international investment and the international forum for high-level and inclusive discussions on today’s multilayered and multifaceted IIA regime. The world is seeing rapid growth of capital market-related policies and instruments designed to promote investment in sustainable businesses and to support the achievement of the SDGs. These policies and instruments are emanating primarily from stock exchanges and their regulators, but with strong involvement from other capital market stakeholders, including institutional investors. The United Nations Sustainable Stock Exchanges (SSE) initiative has seen its membership more than triple in the last two years. It now includes 63 partner exchanges from five continents, listing over 30,000 companies and representing a market capitalization of over $55 trillion. This rapid growth can be seen as a proxy for the increasing attention exchanges are paying to sustainability in their markets. Stock exchanges promote investment in sustainable development through a number of instruments, including environmental, social and governance (ESG) indices, sustainability reporting guidance documents and special-purpose investment vehicles such as green bonds. ESG indices remain the most popular sustainability instrument among exchanges; there are more than a hundred ESG themed indices around the world, with 38 of 82 exchanges providing them. Some 32 stock exchanges provide formal guidance to issuers on reporting ESG information, including 17 exchanges that introduced guidance for the first time in 2016 and early 2017. Moving beyond voluntary guidance, ESG information is incorporated into the listing rules on 12 exchanges. Mandatory ESG disclosure rules are emanating from stock exchanges as well as securities regulators.